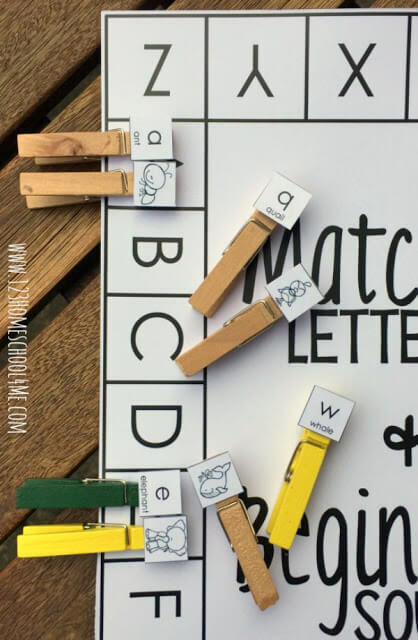 This is such a fun ABC Games to help Preschool, Kindergarten, and First Grade practice matching uppercase and lower case letters as well as beginning sounds with this FREE, fun, hands on Alphabet Letter Beginning Sounds Match game! This free Alphabet Letter Beginning Sounds Match activity allows children to match uppercase and lowercase letters, match beginning word sounds to their letter and read some common words. 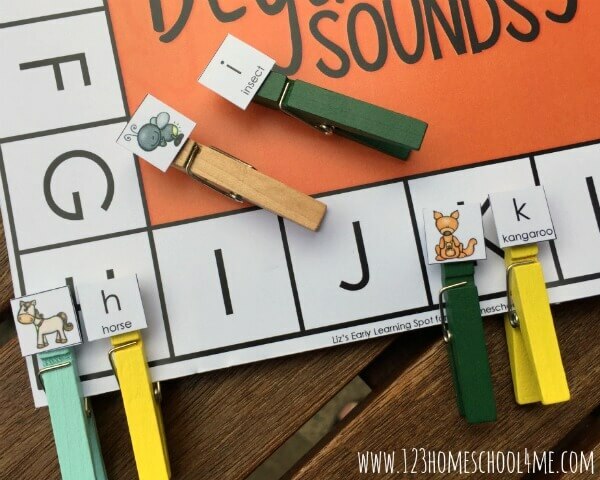 The ability to differentiate makes this activity useful for children just starting to learn the alphabet up to kids who are able to blend letters together to sound out words. This makes it useful for Preschool, Kindergarten and Grade 1 children! 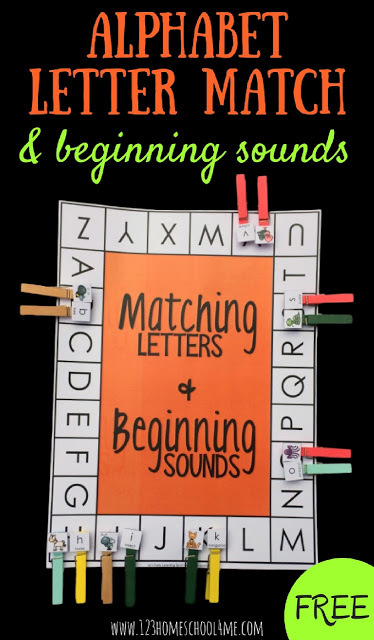 Download this Alphabet Letter and Beginning Sound Match printable below. Print the color or black and white mats onto card. Print the pictures and words onto card, specifying on the printer whether you’re printing in color or black and white. If using the black and white version, color them first if you wish. Cut all the squares to divide the pictures and words. Attach them to small pegs. Either give each picture and word its own peg OR attach a picture and its matching word onto different parts of the same peg so they can be flipped to work with either the pictures or the words and save pegs. I use blu-tac so the cards are easy to remove (when needing the pegs for another activity) but stay in place well enough for the kids while in use. PS: Enlarge the cards if you feel they’re too small! SIMPLER: Just use the lowercase letter pegs and ask children to attach the pegs to the matching uppercase letters on the alphabet mat. MODERATE: Use the picture cards. Ask children the names of the animals (they may need help with this) and to focus on the first letter sound. When they say the word can they hear the first sound and say what letter it is? Can they find the matching letter on the alphabet mat? ADVANCED: Use both picture and letter sets and attempt to read the words under each letter with prompting from the picture. Can they sound out the words to check that they really do match the pictures? SUPER ADVANCED: use only the letter cards and attempt to read the words as they are clipped to the matching beginning sound on the alphabet mat.